Woodford Reserve tells BourbonBlog.com that they will release the Woodford Reserve Master’s Collection Sonoma-Cutrer Pinot Noir Finish in limited quantities in early November 2014 with a suggested retail price of $99.99 for 750ml. The Woodford Reserve Master’s Collection Sonoma-Cutrer Pinot Noir Finish was created by Woodford Reserve Master Distiller Chris Morris, who partnered with Sonoma-Cutrer Winemaking Director Mick Schroeter to develop a release that challenges long held industry definitions of the category. Like Woodford Reserve, Sonoma-Cutrer Wines are also part of the Brown-Forman Corporation portfolio. In a previous Master’s Collection, Woodford experimented with aging their bourbon in a used Sonoma-Cutrer Chardonnay barrel. We’ll bring you our review of the new Sonoma-Cutrer Pinot Noir Finish soon on BourbonBlog.com and we invite you to subscribe to our free Bourbon Newsletter on this link for the latest Bourbon news. 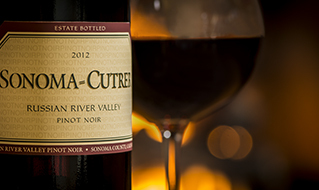 Released as the latest offering under the brand’s umbrella of nine total Master’s Collection expressions, the Sonoma-Cutrer Pinot Noir Finish was created by adjusting the whiskey’s fifth source of flavor—maturation. By finishing a batch of the original Woodford Reserve whiskey in a used Pinot Noir barrel that was shipped directly from the Sonoma-Cutrer winery in California, the release has a unique flavor profile that hasn’t been experienced in a bourbon before. Originally, the barrels aged three unique vintages of the brand’s Burgundian style Pinot Noir, which Woodford says gives this Sonoma-Cutrer Pinot Noir Finish a “refreshingly fruit forward flavor profile. Woodford says they want to make clear distinction that industry definitions require that bourbons be aged in new, charred oak barrel.Thus, the Sonoma-Cutrer Pinot Noir Finish is not technically a bourbon. Rather, it represents the overall direction of the category, one that sees inspiration stemming from ingenuity, passion and creativity. They say the Sonoma-Cutrer Pinot Noir Finish is a release that is inspired by, and pays tribute to, the original commitment to ingenuity that have been constant throughout the history of both brands. Though today home to Woodford Reserve, the distillery has been a category pioneer as early as the mid-1800s, when owner Oscar Pepper and Master Distiller James Crow developed several key processes that shaped the early days of the category, and which continue to be used today, including sour mashing and charred barrel maturation. Today, the Woodford Reserve Distillery is visited by more than 130,000 visitors each year.